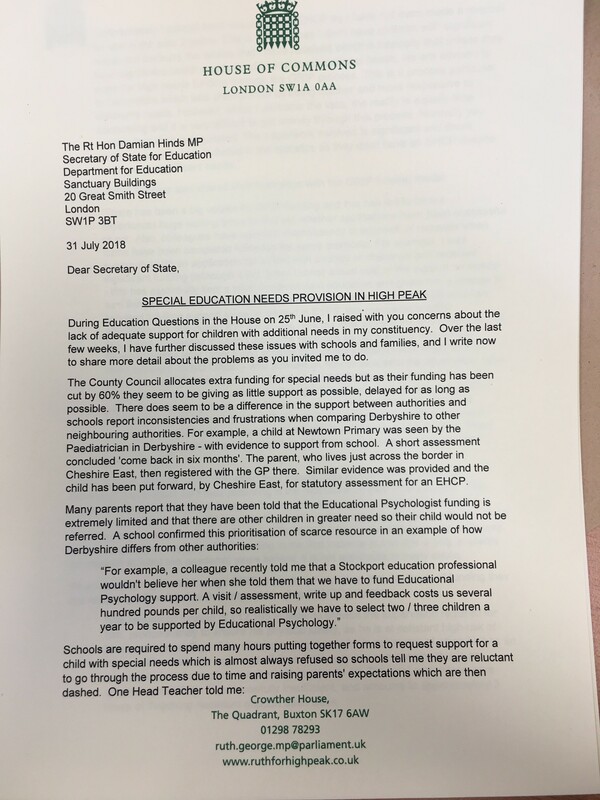 As promised, following my meeting with local parents, I have written to the Secretary of State for Education, Damian Hinds MP, highlighting the concerns of High Peak parents about special needs education. My letter includes quotes from local parents and head teachers, as well as detailed case studies. During Education Questions in the House on 25th June, I raised with you concerns about the lack of adequate support for children with additional needs in my constituency. 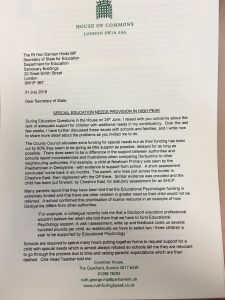 Over the last few weeks, I have further discussed these issues with schools and families, and I write now to share more detail about the problems as you invited me to do. The County Council allocates extra funding for special needs but as their funding has been cut by 60% they seem to be giving as little support as possible, delayed for as long as possible. There does seem to be a difference in the support between authorities and schools report inconsistencies and frustrations when comparing Derbyshire to other neighbouring authorities. For example, a child at Newtown Primary was seen by the Paediatrician in Derbyshire – with evidence to support from school. A short assessment concluded ‘come back in six months’. The parent, who lives just across the border in Cheshire East, then registered with the GP there. Similar evidence was provided and the child has been put forward, by Cheshire East, for statutory assessment for an EHCP. In this context, parents report that when they initially raise concerns, they often feel dismissed and judged, as if their parenting is the root cause of their child’s issues. This makes it very difficult for parents to ask for support with what is a challenging situation. Parents report that if their child is performing well academically but struggling with behaviour or having issues at home, it is particularly difficult to get the assessment process underway. Advice is usually to apply for GRIP funding in the first instance but as this is only available for children at least two academic years behind, it is not applicable in many cases. “We requested funding of £12,195 in order to provide the supervision required for him, predominantly to ensure his physical safety, as he is at constant high-risk of breaks to bones. Part of his condition also means he is not aware of when he has an injury-staff need to be vigilant at all time. I am sure you can imagine this is an impossible task for a class teacher with a class of 30. The total amount we were granted was £2000. This is woefully insufficient, and amounts to approximately 3 hours of Teaching Assistant support each week. When the need is so great, that the request for EHC support is undertaken, the EHCP process is slow and complex; parents and schools report delays, communication problems and misunderstandings. The cuts to funding and resulting staff changes at Derbyshire County Council has resulted in some families having to restart assessments. While the process is ongoing, it is difficult to access support to prevent problems getting worse in the interim. The final EHCPs are not always accurate and do not reflect the current position. One family reports that their child’s EHCP states that their son is awaiting a diagnosis; he has had a diagnosis of autism since 2014. Some families report that major amendments have been made to the draft shared with them which have then been presented as the final plan without discussion. We are geographically isolated in High Peak and have a shortage of specialist provision it means we have increasing numbers of students struggling to attend a mainstream school that is unable to meet their needs. One SENCO shared the experience of one of her students for whom the nearest place is Holly House in Chesterfield. This young girl is unable to manage a one-mile trip to school: how is she going to make a 50-mile round trip every day? So, she does not attend school and gets 4 hours a week from a tutor. She is 12. School holidays create additional difficulties for these families. There is no provision within the EHCP for support outside of school hours and there is little available locally which is able to offer the specialist support needed. Several families report that at least one parent has had to give up work in order to provide the care needed as they are unable to access after-school or holiday provision. This obviously has a negative impact on the family as a whole. The cases referred to in this letter are merely the headlines from reports I have received from many schools and families in my constituency. The families and professionals I meet with in my constituency paint a picture of a fragmented underfunded system struggling to offer adequate support to their children. The parents speak warmly of individual professionals who have tried their upmost to help them navigate the system, but there is an underlying frustration and desperation that marks their interactions with services. I would like to meet with you to discuss further the lack of special needs provision in Derbyshire and the measures that will be taken to address it.